For those of you who don’t know, Peaknits has been in the running for a business grant from the Military Spouse Business Association. Participating in the contest includes daily voting among your competitors, and we have made it to the final round! “The Red, White, & Blue Awards were created to recognize and honor the outstanding achievements of businesses run by veterans and military spouses. This is our inaugural year and our goal is to award six business grants, three to military-family owned businesses and three to veteran owned businesses. In addition, we want to help promote these businesses, not only within the military community, but also in the local communities these businesses help to support” (Red, White and Blue Pages). What would we do if awarded the money? Not only would we be able to offer you a bigger and wider variety of yarns to choose from with our custom handknit and handwoven goods, but we are also creating our own! I have mastered the skill of spinning and am currently working with farms and rescues for fleeces to truly offer you American made and one of a kind items from the ground up. Voting ends August 13th and the winners will be announced August 15th. So if you have a minute, please take a moment and vote for Peaknits! I always get a little giddy when I get a new order in. Once the notification comes through, I’ll do the pitter patter of a happy dance, and utter a little huzzah! I held my breath and froze. What an honor, and it confirmed the fact that one should never take the little things in life for granted. When I got out of the military, I found myself so aloof in the civilian world. I felt so awkward and it took me awhile to adjust. I remember a time when I used to be so scared, not knowing what I was going to do after I stopped serving. I realize now that I never really stopped, it’s just in a different way now. I am so lucky to put my creative side to good use and help others. With that, Peaknits is offering a 10% off on everything to our veterans through Troopswap. If you’re not familiar with the company, you just need to register/verify your service through them, grab your discount code and enter it in our website upon checkout. It’s very similar to Groupon, only geared towards military, veterans and their families. There are some really awesome deals on there, ranging from movie tickets to skydiving. Go check it out! When Air Force Veteran Nicole Snow got out of the military, she knew she wanted to do one thing, and that was to make a difference. Originally beginning as an imports and exports business from Nepal and India, her love of knitting grew to produce Darn Good Yarn (DGY). In working with co-ops, she is able to employ women to hand spin the fabric into yarn. In return, Nicole provides wages, healthcare, educational benefits, and a trade that can be passed down to future family members. She also saved over 10,000 pounds of silk waste from heading into landfills and turning them into yarn in 2012. Do you know where your yarn comes from? Is it acrylic and a by-product of plastic? Would you prefer it to be environmentally friendly, and made from a recyclable source? Biodegradable? DGY provides a myriad of elements to work with such as silk, newspaper, banana fiber, hemp and wool, to name a few. Most people are unaware that there are potentially horrible working environments possibly associated with that “bargain priced” yarn often found in local craft stores. That’s another great thing about this business. All of the yarn is acquired through fair trade, and is not obtained unethically or illegally through the use of sweat shops and/or child labor. You can create with a conscience! Nicole’s business has also created a ripple effect on all artists, both local and internationally. Not only does Darn Good Yarn offer wholesale to independent artists, she works one-on-one with your business, offering personalized service and advice. With literally hundreds of different yarns to choose from, there are a lot of things to take into consideration when placing an order. When starting any project, careful planning is always needed in regards to gauge, type and consistency. No need to get overwhelmed! Nicole is not only patient, but her expertise and insight is priceless when specifically ordering what is needed to create your vision. Custom, one of kind products, that are Earth friendly and human kind approved. Darn Good Yarn. Making the world better, one skein at a time. Whew! For those of you who don’t know, I got hired as a writer for MilPages. Not only has this been a great experience, but I found it exhilarating. Surprisingly, it came as a form of therapy for me, as I was able to get a lot off my chest. I also felt like I was making a difference. 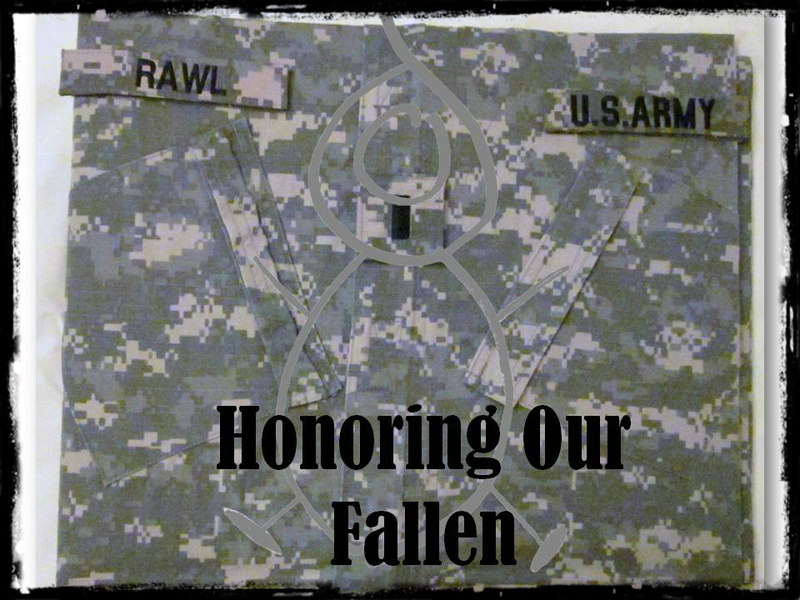 There was a lot out there that I felt people in the military and their significant others needed to know about, such as where to go for help, advice, etc. If I made just one impact, it was totally worth it. That being said, I would like to thank Adam for all the help, guidance, and giving me the opportunity to contribute, from my little corner of the world. It really means a lot! And if you haven’t been by, come on over and see what I’ve been up to! It’s been over six months now, and I figured it’s about time I give you guys an update on the whole homemade laundry detergent experiment, as there have been some pros and cons to it. Initially, I had no qualms with any of it. If anything, clothes seemed to be even cleaner than using the expensive commercial grade stuff bought at the stores. This was proven true with the husband’s uniforms. For the life of me, I can’t figure out why, but his ACUs have this smell to them. It is not dirty, it isn’t clean, it isn’t negative and it isn’t positive. I’m not sure if it’s from his many deployments, just being out in the field, or just the material itself. It is a very distinct Army smell. Regardless, I have found that this detergent is the only thing that removes it and keeps the clothes completely clean. But that’s just it! There is no smell. And it’s almost like they are so clean, the clothes are very quick to pick up any smell it is near. As a result, I am having to do laundry a little more than usual. And to be honest, I miss it. That fresh, smell of clean clothes with a hint of fragrance. Using vinegar as a form of fabric softener works amazingly well. Once the clothes are completely dry, you cannot smell it at all. And for approximately $2 a gallon, I will stick with it. Using baking soda in your laundry detergent works well, but it is not a sure thing. After 6-8 months, your whites will get a little dingy. I have broken down and used some bleach in a whites only specific load, and it all popped back to usual. I wasn’t happy over giving in, but I felt it was necessary, as it was all looking a little gray. I really don’t think that this is necessarily a bad thing though, as using bleach on your clothes 1-2 times a year still seams more healthy to me. A side note to the bleach – I have seen some homemade bleach recipes out there, however, I am hesitant to have chemicals like that in the house with the little one and fur babies. I haven’t tried it, and it may work. I don’t mind buying a bottle of bleach every 1-2 years so it might not be worth the ingredient investment to me personally. Also, it doesn’t matter what smell or fragrance you put in your laundry detergent. If it’s 100% natural it won’t last more than a couple of hours. I’ve used handmade soap, ivory (both scented and unscented). I’ve even gone so far as to put drops of essential oil on a facecloth and have it in the drier along with my clothes. Nothing is permanent and if anything, I feel it is a waste of materials. The static cling in the drier was driving me crazy! Everything I read said to just moisten your hands with a little bit of water before pulling the clothes out of the drier, or to use a spray bottle and lightly mist them. It helped, but it didn’t help with the lint problem. Although we have plenty of the lint removed out of our trap, little bits of pieces would still invariably cling to certain articles of clothing. Especially my husbands PT pants and shorts. I was having to use a lint brush on them at one point. So, last night, I snapped and bought some lavender drier sheets. At the store. Part of me feels really bad, but part of me feels like I can only go 100% organically natural only so much. I feel somewhat better in the fact that the box read “100% biodegradable ingredients” but I still feel guilty. I will let you know if this makes the difference in my homemade laundry detergent quest. In the meantime, I will still look for an all natural alternative for drier sheets that actually work. Stay tuned! 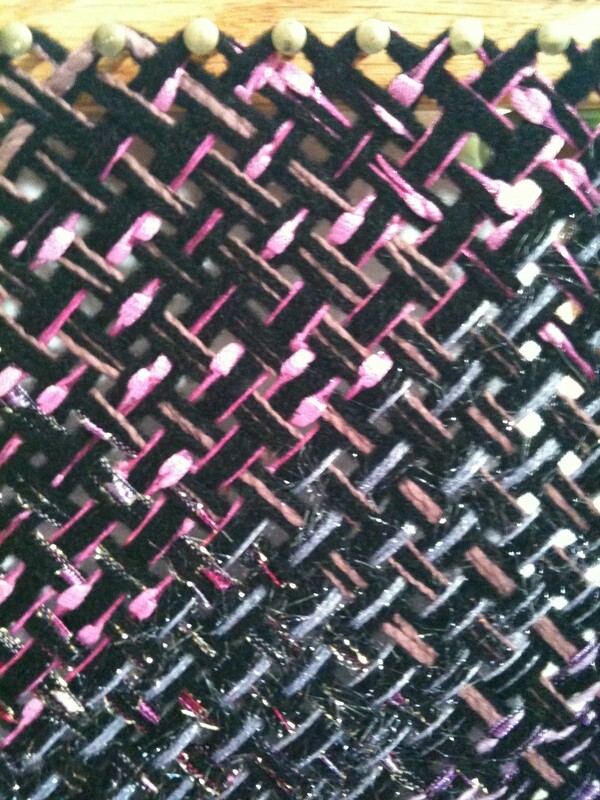 One of the things that I love about weaving is the instantaneous gratification. If you’re not certain how a particular color scheme is going to look, or are just simply anxious to see it, you can literally have a sample of it done in a day. The tough part is the accumulation of said “samples”. The problem I am running into in my shop is that I am bored with my blankets and would like to expand my abilities as an artist. Yes, I’ll admit it – over two years of creating squares and rectangles have left me wanting more. And although I have grandiose ideas, it requires a lot of piecework – some take anywhere from 6-8 individual three foot triangles that I have to piece together. And this my friends, takes time. Time and dedication at staring at the same color scheme. Not to mention the prolonged fear that possibly, I might run out of yarn before the huge project is completed. A fear to commit begins. I love my yarn, but I had a bad habit of not writing down my original intentions. And after time has lapsed before I actually start to work on it, I use more of it than I intend to and then a “whoopsie” occurs. This typically happens when I buy something to “accent” and just fall in love with it so much that it consumes my project and I use it throughout the entire piece instead. Then add in the custom orders – such as using my husband’s uniforms to upcycle into albums and crafts, and having so many scraps left over. I couldn’t just throw them all out without a guilty conscience. This led into wreaths, purses, and other ventures I’m still working on to add to the shop, in addition to my knitting and weaving. Simply put, I may only advertise 1-3 new items a month in the shop. And sometimes I have a bunch go up at once. This is because the reality of the situation is that I am working on 9-12 projects at a time. Sometimes I’m in the mood for it all, sometimes I’m not. And I can never tell you which will be finished. As much as my business brain would love to have first in, first out, it’s never a reality. With me, I never know! 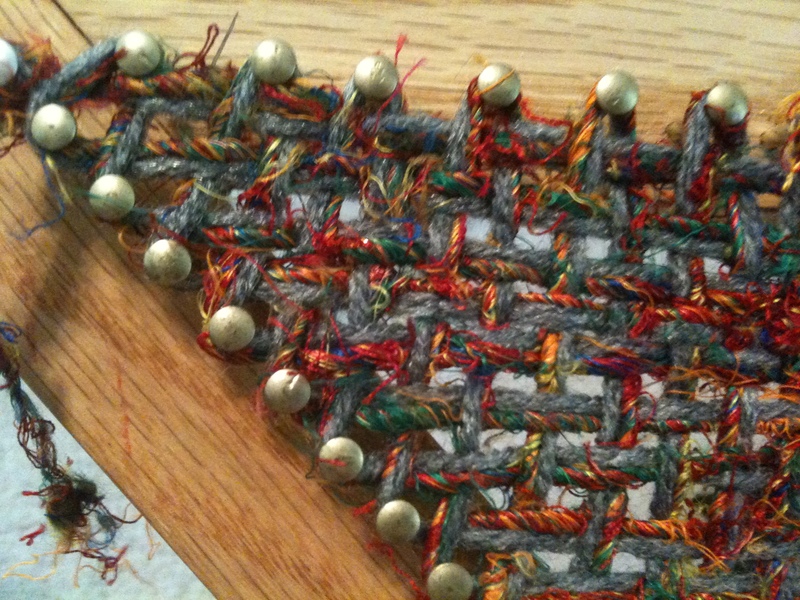 Of All Things, Why Choose To Be a Fiber Artist? You see, for many years I thrived on anger. I’m not going to woe you with my childhood or my teenage years. As tumultuous as it was, it is what has made me, me. But in coping with it all, I was angry. I took that anger and embraced it. It’s what got me through it all. When it comes to certain times in your life, you have to hit the ground running. You cannot hesitate to think, or feel or reflect on what just happened. You need to stand tall and continue on to find a way. It doesn’t matter if it’s something that you want to do or not, but need to. I carried that anger and utilized it to the best of my ability. It got me through family problems. It got me through basic training. It’s how I learned to work out and push myself those extra miles or shaving time off my run. It’s what got me those promotions at work. It’s what made me invincible – I would do things and not remember them. That 10 mile uphill run that left me shaking afterward? I didn’t remember it, because my brain was going a mile a minute. If it hurt, it didn’t matter, because I wouldn’t feel it until after. Long after. But when it was over, I could look back and I would feel so good and accomplished afterwards. Then I got deployed and an incident occurred that no matter what the training was for, I never would have been prepared for it. Superiors couldn’t give me the answers I was looking for, and things went from simple to intricate in one unexpected moment. It wasn’t about regulations and course of action anymore. My soul was in a quandary and it didn’t sit well. Regardless of what that incident was, I realized that things needed to change. And shortly after that, I met my husband, who had this oddly calming effect on me. Maybe it was the point in my life where I was allowing someone to come in. Maybe it really was him. Whatever it was, it worked. But then I got out of the military as he went Active Duty. And his yearly deployments grew from just a couple of months long to over a year. Life happened and anger started to build once more. As much as I longed for it, I did not want to start smoking again. This is where fiber started to speak to me. I used to think knitting spoke to me because I needed to do something with my hands once I quit smoking. Plus, my great-grandmother taught me, and I knew she would be proud. But the truth is, I can sit for hours with the biggest tangled mass of yarn and be completely content and calm. It’s soothing. As I figure it out, it gives me time to internalize and figure myself out. I take different perspectives on situations and come to different conclusions. Agree to disagree. And as I come to my resolution the clouds part and I’ve got a tightly wound skein with no knots. A fog clears, that I didn’t even know was around me. So much different than the past, when I would look at life with a red tinge around the edges at everything. So much better. All is right in the world once more. Centered. 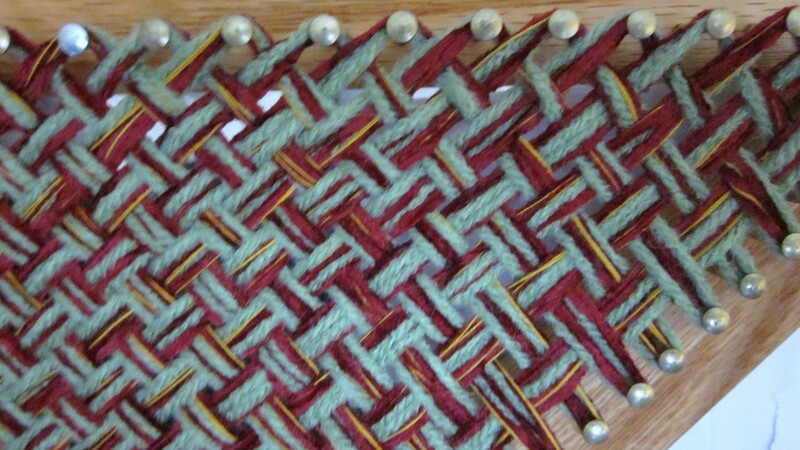 And weaving – where do I begin? It’s methodical, it’s continuous, yet at the same time has a beginning and end. It listens to your hands, and no matter how much your brain is going, it never interrupts. Only when you are too upset and being too abrasive with the thread – you snap the yarn. I never realize it until it happens. It forces you to be calm. 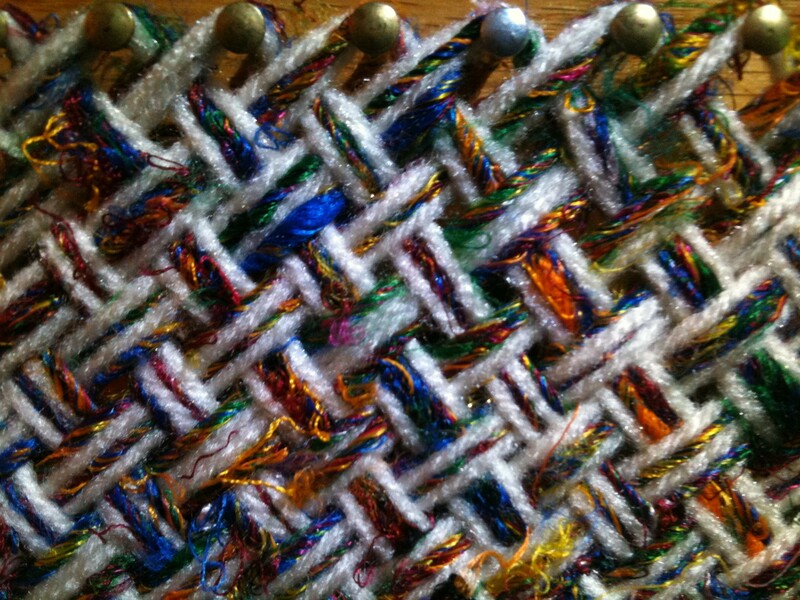 And if you’re not in the mood, or just cannot seem to get in the zone, it is simply not a weaving day. Find something else to do, and try again later. There’s always tomorrow. Maybe it’s my new form of meditation. But it centers me. It doesn’t matter if I make sales, as I refuse to allow consumerism dictate my soul and my business. 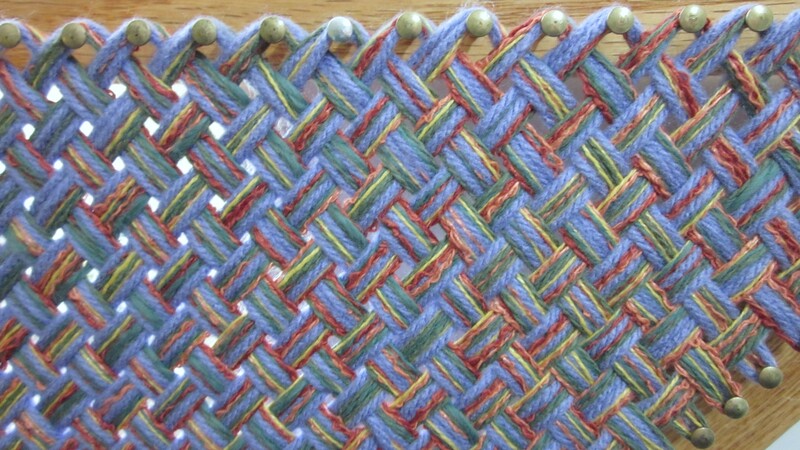 And to be honest, if I don’t weave for awhile I tend to get irate. I need it. I did not choose to be a fiber artist. If anything, it chose me.